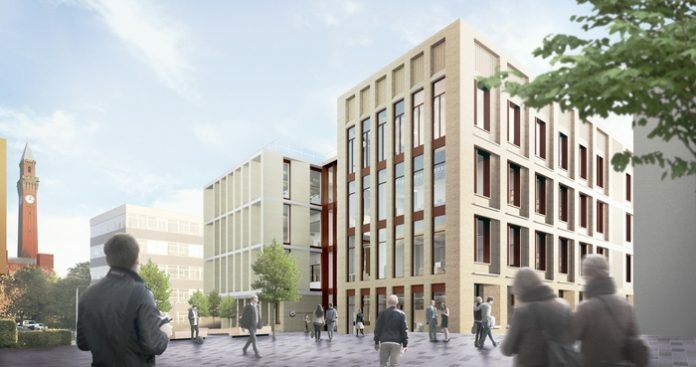 Willmott Dixon has secured the £46.5 million contract to deliver a new home for the University of Birmingham’s School of Engineering. This is the second time that Willmott Dixon has been appointed by the University to a major project this year – bringing the value of work being delivered by Willmott Dixon for the University of Birmingham to nearly £90 million – and comes a few months after the company opened a central Birmingham base at One Snowhill. The School of Engineering was formed by the University in January 2016 and includes the disciplines of civil engineering, mechanical engineering and electronic, electrical and systems engineering. The new building will house both the School of Engineering and UKRRIN Rail Digital Systems Innovation Centre (DSIC) and will be a striking new signature building for both the School and University to promote engineering excellence. The UKRRIN Rail Digital Systems Innovation Centre will establish a word-leading centre of excellence and research for railway research on digital systems, focusing on matters such as railway control and simulation, and data integration and cyber security. The building will offer a variety of contemporary and flexible design and research spaces that act as an incubator for innovation and strengthens teaching and research partnerships. It will provide the increased spatial requirements of office, meeting and lab spaces resulting from the School’s projected growth. The arrangement of these spaces around a generous atrium containing flexible learning environments will also enable greater collaboration between staff and students. Designed by Birmingham-based Associated Architects, the building’s interior will feature exposed structural elements such as supports, pipework and services, providing a practical display of its own engineering. Externally, it will feature a half-brick, half-clad facade to provide a strong visual impact, with cues taken from railway lines and trackside signalling that connects it to its core specialism. With work starting in August, the project was secured through the Constructing West Midlands Framework. The relocation of the School of Engineering to this new building is part of the University’s masterplan to bring schools together on the campus creating, in this instance, an engineering hub. Daniel Holmes, University of Birmingham, said: “This new building represents a celebration of engineering and will be a centrepiece of our new engineering hub. The ongoing collaborative relationship that we have with Willmott Dixon, along with the quality of delivery of their completed projects, gives us significant confidence that they will deliver this landmark building. Other recent projects on which Willmott Dixon has been appointed by the University includes the new research data centre, and the Teaching and Learning Building which is currently on site and will welcome its first intake of Year 12 students once completed in 2020. The project is another example of Willmott Dixon’s track record in the university sector, with over £400m of work on site. Other current projects include the new School of Medicine for Anglia Ruskin University in Essex; Kingston University’s new landmark Town House; a cutting-edge sports hub for the University of Warwick; and conversion of a former naval hospital within a world heritage site into a student hub for the University of Greenwich.